Marjorie O'Neill. I loved that woman. She was so sweet to me, even when she had no reason to be. She taught me how to knit (several times), taught me how to bake but more importantly taught me to be a better person. To be patient, to listen, to serve others with a happy heart and to show love through baking. This is one of her recipes I added a trendy ingredient to. It doesn't make me cry like her Belgium Cookies (renamed Crying Cookies) but I do love opening her cookbook and remembering her in this small way. Nanny called this recipe "Chocolate Cookies" which might lead someone to believe they are dark, with cocoa in the recipe. I renamed it, but the ingredients are the same-ish. Cream butter, shortening*, sugars, eggs and vanilla until light and fluffy. I make a well in my wet ingredients and blend the dry ingredients in the well before mixing into the wet. If you want to do that separately (mix dry, add to wet), that's totally cool but you're doing an extra dish. Mix dough thoroughly. Mix chocolate chips and salt into dough so it's evenly dispersed, no mouthfuls of salt once baked - blah. Bake at 375F for 8-10 minutes until just brown on the edges. I used an ice cream scoop to make even sized jumbo cookies, and 10 minutes did the trick. 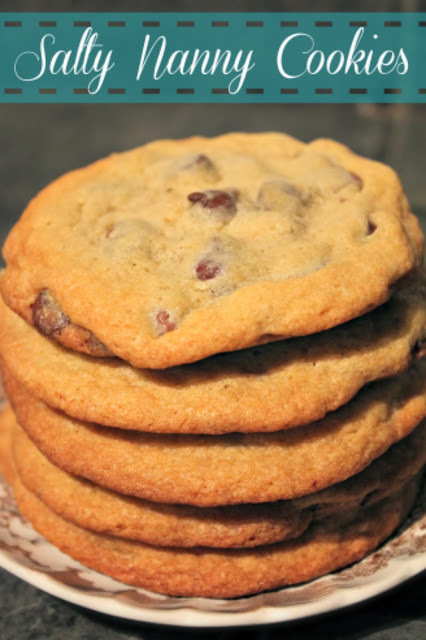 Oh boy, chocolate chip cookies meets the salted everything sensation….perfect. Sweet Genius.